When Marisa Cappelli transferred to the University of Rhode Island this past fall from Rhode Island College, she was disappointed to find that her former sorority, Delta Phi Epsilon, was not present on campus. Rather than accepting the end of her Greek Life experiences, Cappelli has been working to generate enough interest through the female student body to install a new chapter at URI. On Feb. 2, Cappelli attended a spring recruitment event Â where she was able to address potential new members and generate support for Delta Phi’s addition. She attributed part of the night’s success to her sorority sisters from RIC, who also attended to help her advocate for Delta Phi. “I had a good amount of girls come up to me and they all seemed very interested in bringing a new sorority,” Cappelli said. At the moment, Cappelli has serious interest from about 40 girls. 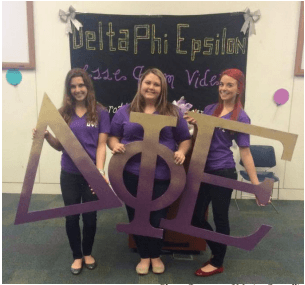 In order for a Delta Phi Epsilon chapter to be instated at URI, Cappelli must generate the interest of roughly 100 girls before Simo or the Panhellenic Association (Panhel) will reach out to nationals. Although there are already 10 social sororities currently on campus, Cappelli feels that Delta Phi Epsilon would bring more options to the female student body. One of the reasons Cappelli feels so strongly about bringing Delta Phi to URI is because of the philanthropies that they support – cystic fibrosis and ANAD, anorexia, nervosa, and associated eating disorders. If Cappelli is successful in establishing a new chapter of Delta Phi, news members will have a unique opportunity to be founders of the new sorority. Cappelli is assuming that the sorority will have to be based off campus since there’s no available housing on campus for another sorority at this time, but she hopes that Delta Phi will be on campus eventually. While this could be seen as a deterrent of some women looking to rush next fall, Cappelli hopes that a shared passion for Delta Phi’s core values, sisterhood, justice and love will transcend this. Simo and Tatyana Leite, president of the Panhel Association, were both reached out to for comment but failed to reply. Photo Caption: Marisa Cappelli (middle) with two of her Delta Phi Epsilon sisters at RIC.